Tuvayhun, by composer Kim Andre Arnesen and lyricist Charles Anthony Silvestri, will be performed at the Angel Orensanz Center in Manhattan. Hope. Universal human needs and dignity. Peace. Blessings. “Tuvayhun – Beatitudes for a Wounded World” captures these themes and seeks to inspire and unite through an extraordinary musical experience. 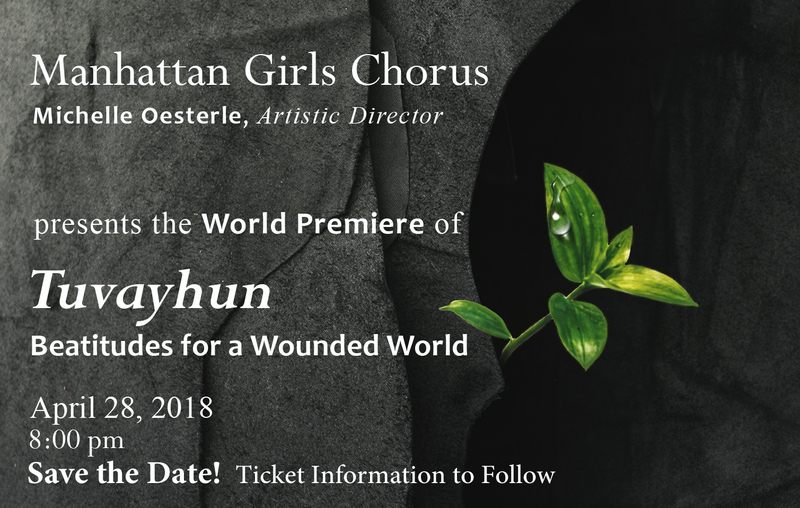 On April 27, the Manhattan Girls Chorus will present the world premiere of this commissioned work by celebrated Norwegian classical composer Kim Andre Arnesen and acclaimed lyricist Charles Anthony Silvestri, accompanied by a select group of world-renowned soloists and instrumentalists playing ancient instruments. The venue, the Angel Orensanz Center in downtown New York City, is the fourth-oldest surviving synagogue building in the country and provides a magnificent, soaring backdrop for the evening event. The Manhattan Girls Chorus itself is inspirational. Founded in 2011 by Director Michelle Oesterle, the Chorus includes 50 young women in grades 5 through 12 from all ethnic and socio-economic backgrounds. They come together for musical excellence but also for leadership, self-esteem, and so important in today’s social-media, 24/7 world, a sense of community. The Chorus regularly appears on some of the world’s most famous stages, from Carnegie Hall to Lincoln Center, performing under iconic conductors as well as with rock and Broadway stars. Yet the girls are equally pleased to lend their voices to give back to the community, out of the limelight. More information can be found at http://manhattangirlschorus.org/home/ . For anyone seeking an uplifting evening, wanting to hear hope, to see the bright and inspiring, uniting faces of our future, it is an evening not to miss. Rebecca Patterson is Chief Investment Officer at Bessemer Trust. She is a member of the firm’s Management Committee. Prior to joining Bessemer, Rebecca worked at J.P. Morgan, as Chief Markets Strategist for Asset Management, as Global Head of Foreign Exchange and Commodities for the Private Bank, and as an Investment Banking Research Analyst. Prior to J.P. Morgan, she was a journalist in the U.S. and Europe. She is a member of the Council on Foreign Relations, the New York Federal Reserve’s Investor Advisory Committee, the Economic Club of New York, and chairs the University of Florida Investment Corporation’s Advisory Board. Additionally, Rebecca is a regular CNBC contributor. American Banker has named her one of “The 25 Most Powerful Women in Finance” for the past four consecutive years. Rebecca earned an M.B.A. from New York University, an M.A. in international relations from The Johns Hopkins University School of Advanced International Studies, and a B.S. in journalism from the University of Florida. She has two daughters and lives in New York City. Hansel and Gretel: a Holiday Feast for the Family.